What’s New at Upstate Vegas Events? We now can provide more event services like a photo booth and/or a DJ to enhance your experience. Contact us and we’ll be happy to discuss the details with you. We can now provide BINGO services for your event. Please, Contact us and we’ll be happy to discuss the details with you. Please book EARLY for your special holiday event! December and January are typically great months for holiday party events. Upstate Vegas Events wants to help bring that fun, holiday spirit to your next company or private social gathering. If you are considering a casino holiday party, please book early because those popular Winter time dates fill up quickly. Upstate Vegas Events accepts event payment using International Monetary Systems barter for the cost of the equipment and table rentals. 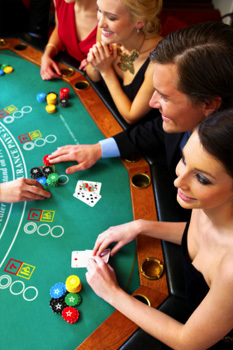 Therefore, if you are an IMS barter system member, our casino parties are a fun way to use barter dollars. We have updated our fundraiser brochure, so please take a look. Utilize the many ideas listed in your next casino fundraising event. Janice Bartz, co-owner of Upstate Vegas Events, was selected to become a member of the National Association of Professional Woman. Inclusion in this organization is a privilege thousands of professional women throughout America share. This prestigious honor was awarded because of Janice’s outstanding leadership and commitment within her profession. ZEE Designs has updated the Upstate Vegas Events website with a new look and mobile-friendly features. Now you can now view us on any of your smartphones or tablets. WEBSTER MARCHING BAND FUNDRAISER EVENT LOCATION: WEBSTER COUNTRY CLUB CONTACT: DEB PARTRIDGE @451-8011 GAMING TIME: 6:00-8:30 P.M.
“See the Casino Experience” Click the arrow on the home page to view our video. Upstate Vegas has made the recent issue of Rochester Womens Magazine Article 1/1/2013. Click on the link to view the article. We updated our website to provide links to our Facebook and LinkedIn pages on the internet. So view pictures and information regarding events from around the Buffalo, Rochester and Syracuse areas by following these links. A large fundraiser event held at the Blue Cross Arena had Brother Wease and Rochester Amerks serving as guest dealers. The 100-person Texas Hold’em tournament and casino night raised funds for Brother Wease’s Kids. Hope to see you next year!